Just saying, sometimes on loading a world or creating one with this mod installed for 1.12.2 I crash with a concurrentmodificationexception. I create a new world, make a waypoint at my spawn, and bam, crash. We can't even see waypoints when the map is full-screen. In the 1.13.2 version, waypoints on servers don't save after closing the game. Not sure if this has already been noticed. I love this mod, but I don't understand why we can't see mobs when the map is full-screen. Is it a coding issue or have I missed something? I remember seeing this before if not the whole map on either the older versions or Journey map but Could you possibly make it were we could see like 2x the radius of mobs around us on the world map? It would be really helpful when looking for a certain mob. If you read this Thank you for taking the time! 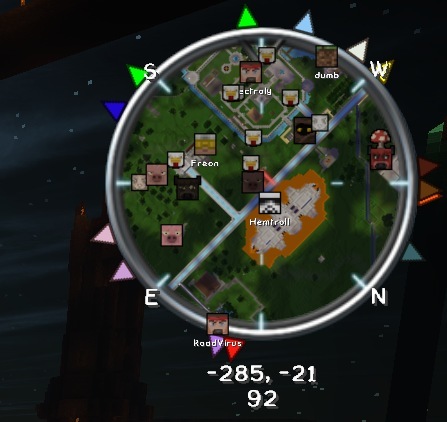 is there a way to get cave view on the worldmap? Is there also a way to export the worldmap (just the top view)? Forge 1.13.2 is out for a public beta. Can you update to using that? How do I input a seed? I'm on a server and I know the seed, and whenever i try to insert it into the seed box, it doesn't save it. I've click, press ctrl+v to paste it, then enter, but it doesn't work. How do I do it? Shame that this mod isn't open sourced, it's literally the best map mod i've ever used. And probably will ever use. Thank you for this mod. Is it possible to change the silver outline map please (the border is too wide for me) please ? So, i might be missing the obvious. But my waypoints are not being saved on Realms, while it is on single player. Anyone any suggestions or the solution? Could you consider porting to fabric (1.14)? I'd do it myself but it's not OSS. Thanks! I found zh_cn(1.13.2) translate was awful,with many unreadable code.I retranslated everything. Thank you very much @MamiyaOtaru for making this mod! If at all possible, here are a few feature requests for you to consider adding some day. Similar to the Latest Death waypoint, automatically create a waypoint after going thru a portal. So many times I have used a portal then when out exploring only to become lost and unable to find the portal back. Show the time of day/night in the radar. Perhaps make the ring of the radar into a rotating image where the top is the current time? Option to disable the Multiworld feature. When playing on a vanilla, non-multiworld server, the frequent text about the (unknown) world when jumping dimensions is very annoying. Thanks again for your amazing work and thank you for considering these features. I keep getting lots of this kind of report in logs, often quoting a lot of different items from different mods? Whats going on here? Because its spamming my logs to the point where they shut down. i fixed the lang messages for zh_cn.